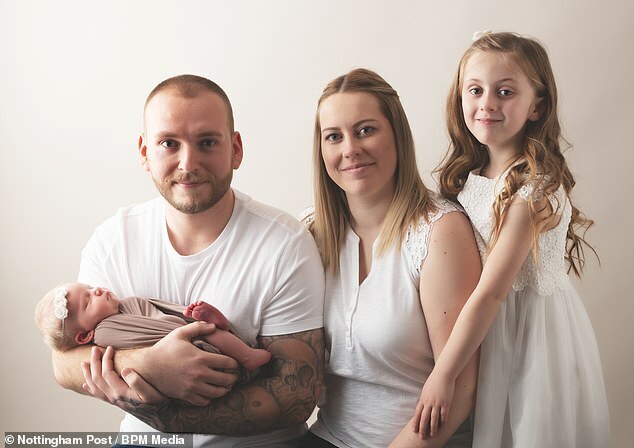 A mother has told how she suffered a stroke aged just 29 which doctors fear was triggered by giving birth just two weeks before. Lexy Walton-Godfrey, from Blidworth, Nottinghamshire, claims her stroke felt like a huge magnet was pulling her down. Mrs Walton-Godfrey has now credited her husband, Chris, for saving her life, saying without his quick reactions she could have died. However, she has been left with short term memory loss because of her stroke, and has become reluctant to speak because of her slurred speech. Mrs Walton-Godfrey, who is mother to six-year-old Mia and six-week-old Hollie, said the stroke came on like the ‘most intense feeling ever’. She said: ‘It felt like a huge magnet was pulling me down to the floor and I had an excruciating pain in the right hand side of my head.